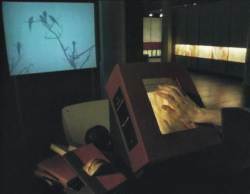 The Surprising Spiral is an interactive artwork, utilizing a computer controlled videodisc, computer graphics, digitized sounds and texts, and synthesized voices, embedded within sculptures. The work responds to the form of the viewer/participant's engagement. The viewer's ability to interact and direct the flow of images and sounds allows him or her to "play" the piece, to seek or escape from finding a destination, or to enjoy its labyrinthine paths. There are two sculpture/interface objects through which a viewer can interact with the work. One is a large, hollow handmade book (13"x 15"x 6") in which are encased replicas of human hands. In a cut out in the center of the cover is embedded a transparent touch screen, which appears to be the glass "cover" of the book. On this touch screen are fingerprints, placed above the fingertips of the larger hand within the book. When a viewer touches any of the fingerprints, various things can happen: there are always sound responses to these touches, usually speech; the video can change to another location in the world, or an animated text might be evoked. In any case, a turn is taken in the labyrinth. The work has a complex cause and effect structure, and a touch that the viewer makes might have an immediate visual response, happen a short time later, or much later. I wanted these to mirror our daily cause and effect experiences. That is, sometimes we see the results of an action immediately, very soon, much later, etc. No two viewers will see the same flow of images or hear the same sounds in the same sequence, and the actions of previous viewers will also affect the structure found by another viewer. On the spine of the book is the title La Espiral Sorprendente, the title of the work in Spanish. It is an homage to Borges and Paz, the writers who inspired this work. The other interactive object is also a book, an actual book of Octavio Paz, The Monkey Grammarian. Embedded in the cover of the book is a casting of a man's lips, and between the lips a faint red light glows. When a viewer holds their fingertips upon the lips, one hears texts from the book spoken aloud. When the hand is removed, the text ceases, and the mouth falls silent again. If no one does anything to interact with the work for a length of time, it follows a path of images that lead to one of the looped "nature" images. At this point, the work will also clear its memory of the touches previous viewers have made, and it begins anew when touched again. These objects are set upon furniture sculptures made by author, and these stand upon a painted wooden platform. The work is about the simultaneous sensations of ecstasy and emptiness which arise from the labyrinthine nature of traveling, of being in motion; the mind reflecting upon itself and upon the organization of languages, thoughts and perceptions. Images flow from one place in the world to another, a continuous movement of the passenger, the one walking through, passing through; the view of the world along the path, with no end in mind. These are images that I recorded from 1979 to 1991, in the USA, India, Japan, Argentina, Thailand, Scotland, Sri Lanka, utterly without any conception of cinematic mise en scene. They are the remains, the visual and auditory residuum of what has been passed by, moved through. As a reverse side, moments of the camera's fixity which have observed what we think of as "nature", that is, time outside of our own determinations, events unfolding oblivious to human purposes, the temporal order which marks our own passage through time, whether we are in motion or not. born 1952, Pittsburgh, Pennsylvania, USA, lives and works in New York, studies art and theory of communication in Antioch College, Yellow Spings, Ohio and California Institute of the Arts, School of Art, Valencia, currently professor of computer art and faculty member at the School of Visual Arts, New York (USA). The artistic practice of Ken Feingold comprises photography, film, video and interactive installations. His works are distinguished for their innovative solutions for interfaces between the man and virtual worlds. Mechanically and technologically complicated spatial installations of his are conditioned not only by the achievements of computer technology but also by the critical theory and philosophy.